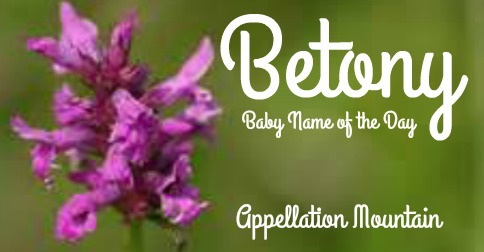 Betony is a rare botanical name that could wear well on a girl today. Thanks to G. for suggesting our Baby Name of the Day. A confession: I’m struggling to unravel which plants, precisely, are called betony. 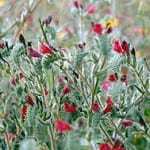 That’s probably because it’s part of a big group of flowering plants, which seems to include everything from the Chinese artichoke to bishop’s wort and hedgenettle. Or maybe some of those are names for the same thing. What I can confidentially report is that the scientific name is stachys, which is a likely a non-starter as a given name. Betony flowers from July to September, making it a perfect possibility for a summer baby. 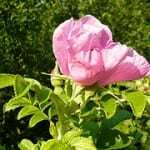 The plant has been used for various medicinal purposes for ages. The name was originally vettonica, named for the Vettones – a tribe living in modern-day Spain. It’s thought they might have Celtic roots. The Roman military reached their part of the world around 25 BC. A Roman physician named Antonius Musa mentioned the herb not long after. Pliny made another early reference to the plant in the first century AD. If all of the references are believed, betony can cure almost any ill. It can keep ghosts from haunting graveyards and ward off bad dreams. It cures more mundane woes, too – arthritis, gout, and possibly snake bites. Medieval monasteries grew it, and apothecaries stocked it. An old Italian proverb suggests that you should “Sell you coat and buy betony.” A similar Spanish saying also supports the idea that the herb was seen as a cure-all. Then there’s English actor Paul Bettany – same pronunciation, different origin. Bettany has starred in critically acclaimed movies, like 2001’s A Beautiful Mind, as well as blockbusters like The Avengers series – he voices Jarvis, the hyper-intelligent system that supports all of Iron Man’s advanced technology and operations. 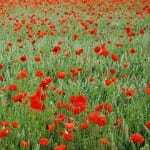 There’s also an English historian and broadcaster named Bettany Hughes. And here where it gets confusing. It appears that Bettany may be a form of Bethany, as in the village in the Bible. 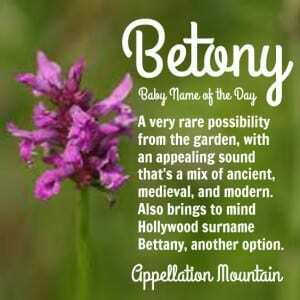 Or, more likely, Bettany is a place name inspired by the plant name – but altered because of the Biblical reference. Regardless of origins or meaning, what we can say for certain is this: Betony is rare. It’s the name of a character in a young adult fantasy series by Elizabeth Kay. Should The Divide and the rest of the trilogy ever become a movie, maybe it would boost the name. As of 2014, neither name was given to even five girls in the US. Back in 1978, eight girls were name Betony. Bettany has never registered on the Social Security charts, meaning it has never been given to even five children in a single year. And yet, there are dozens of reasons to think this name could work. It fits with three-syllable, ends-in-y names for girls, from Kimberly to Emily. It could be a smoosh of Beth and Annie, and it could easily shorten to Betty or Bette. 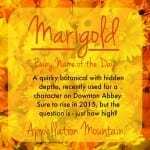 And parents continue to consider ever rarer nature names. Overall, if you’re after an extremely rare name from the natural world, Betony is one to consider. What do you think of Betony? 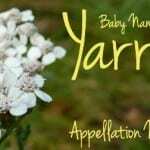 Does it work as a child’s name? Aww this was cool to see. I’m Canadian and am used to everyone butchering my name. I just gave up and go by Bet now mostly, but I do appreciate it when people try to pronounce it properly, which would sound like Bettany. If you do name your child this they’ll probably end up with a thick skin and be able to laugh when people call them Be-Tony. The worst thing is when someone assumes you have spelled your own name wrong because of their own preconceptions! “Do you mean Bethany?” – No I absolutely do not! If you tell me your name is June I wont assume you mean Jane! But I’m all for more Betony’s in the world. But just be aware they have to fight their corner! This feels like an elegant way to honor a Grandma Betty. Clever and lovely! Betony is one of my favorites! I love a good obscure plant name. I’ve always liked Bethany but find it slightly dated. Betony/Bettany just freshens it up a tad somehow. Despite not generally liking surnamey-type names, I have to say that I find the Bettany spelling more appealing. I find its appearance more balanced and “namey”, for some reason, and Bette and Betty feel more intuitive as nicknames. Oh, and Paul. Panya, that name is stunning! My first choice for a daughter is Alma Bettany Katherine, because my great-grandmother’s name was Alma Bess, my younger brother’s name is Bret, my birth name is Stephanie, and our mom’s name is Kathy — IMO, this combo is the perfect mash-up of those names. Plus, it doesn’t hurt that I really like Paul Bettany’s work.